The fifth FLIP Inquiry Series: Behind the Buzzwords - RegTech was held on Wednesday 27 February 2019 at the Law Society of NSW. Our expert speakers engaged in the discussion about RegTech and what it means for lawyers, applications of its use, potential RegTech solutions and regulatory challenges. The fourth FLIP Inquiry Series: Behind the Buzzwords - Artificial Intelligence (AI) was held on Wednesday 12 December at the Law Society of NSW. Our panel of experts explored AI and its features such as machine learning, predictive analytics, application to law, potential and actual use by courts and governments & issues around fairness, bias and regulation. The third FLIP Inquiry Series: Behind the Buzzwords - Blockchain was held on Wednesday 24 October at the Law Society of NSW. Our speakers engaged in a thought provoking look at “blockchain” from all angles including ethical, regulatory, risk management, crime, privacy and legal practice perspectives. The second FLIP Inquiry Series: Behind the Buzzwords - Metadata was held on Wednesday 29 August at the Law Society of NSW. Metadata is a buzzword that has been floating around lately, and our panellists decoded exactly what is it and how it applies to the legal industry. Law In Order is the leader in end to end document and digital solutions to the legal industry providing litigation support through document production, discovery management and court services. 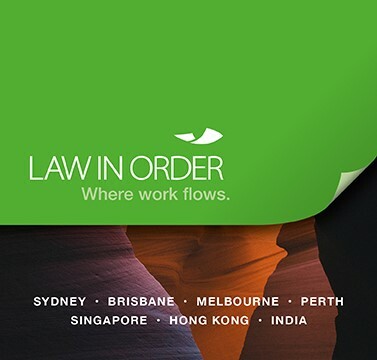 Law In Order operates 24 hours, 7 days a week in Brisbane, Sydney, Melbourne, Perth, Singapore, Hong Kong and India. The first FLIP Inquiry Series: Behind the Buzzwords – Cyber Security was held on Wednesday June 20 at the Law Society of NSW. Our prominent speakers explored the buzz around cyber security and discussed a range of topics, including trends in cyber security, common claim areas and potential risks for lawyers, ransomware, data breaches and steps a law practice should take if it has been the victim of a cyber-attack.